Combine your kite day with a fruit day and encourage the children to bring some coloured fruit to match the bright colours of our kites. Involve parents and friends. Invite them to come and watch or join in, some may even like to purchase a kite from your school as a fund raiser. 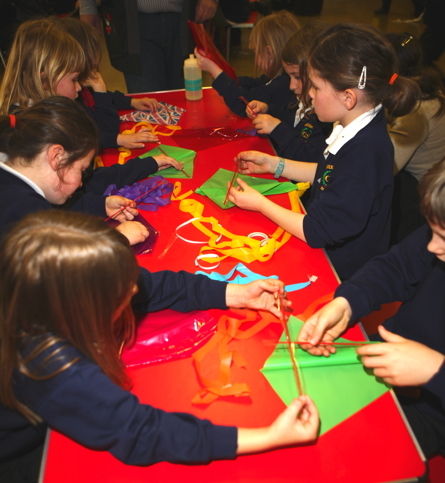 Hold your kite day on a Friday so it will encourage the children to fly with their family on the weekend. TOP TIP – Grandparents and Aunties and Uncles love it! To publicize an event such as a fete, hold your kite day two weeks earlier. Invite the local newspaper to take photos, and also mention your coming event in their story. Don’t worry about the weather. Our kites fly in everything except pouring rain and very strong winds. Some schools in Scotland held their kite day in the snow in January. Take your left over sticky tape, a hole punch and a pair of scissors when you fly so you can make quick repairs and cut out tangles and re-tie kite lines if you need to..
Have a science lesson in the week before your kite day. Kites are a feature of almost every culture, old and new, from India and China to modern kite surfing. Why not combine kites with your multicultural activities program? Practice tying knots in class the week before and set a weekend task of encouraging your children to have their family help them practice tying knots.